BRUDERHEIM, CHIPMAN, FORT SASKATCHEWAN, GIBBONS, KRAKOW, LAMONT, LAMOUREUX, REDWATER, ST. MICHAEL AND SKARO. 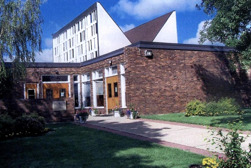 The Catholic Community of Our Lady of the Angels in Fort Saskatchewan, is part of the Archdiocese of Edmonton, in the Province of Alberta. Historically, the archdiocese was preceded by the Diocese of St Albert which was erected in 1871 (Part of Diocese of St. Albert were present dioceses of Calgary and St. Paul). The present archdiocese was erected in the year 1912. The Archdiocese covers Central Alberta, Edmonton Capital Region and the middle and upper half of the Alberta's Rockies region. From the year 1912 to 1975 vocations to the priesthood was considerably good in number. From middle of 1975 the vocations to the priesthood were diminishing and the Archdiocese was facing a real challenge to replace the ageing priests with the newly Ordained Priests to keep serving the parishes. It was very difficult for the then Archbishop Joseph Mac Neil to provide a priest for each of the Parishes due to lack of vocations. Then in mid 1980 Archbishop Joseph MacNeil formed a review committee to go around the diocese and to find out the possibilities of amalgamating the parishes together and keep the life of the parishes going. A questionnaire was sent to all the Parishes in regards to the restructure of the Parishes. the APC (Archdiocesan Pastoral Council) summarized the results of the questionnaire in a document entitled A Synopsis -- Amalgamation and Closure of Parishes -- The Shortage of Priests Issue. the APC formed a subcommittee to develop guidelines for the archdiocese which could assist parish communities faced with the possibility of amalgamation or, in rare cases, closure. The subcommittee's final report was approved and accepted by the APC in June 1992.
the APC formed a committee to prepare a package of the final report for discussion at the regional and parish level. The package, called Parishes in Transition, was sent out in November 1992. After feedback, the Parishes in Transition made its final report in September 1994. It concluded many in the archdiocese were not prepared for change in parish status. Among many of the proposals, it recommended to provide a structure to continue the process. It was to be a collaborative and educational process. After reflecting on this report, in February 1996, the Transformation of Parishes (ToPs) task group was formed at the request of the Archbishop Joseph Mac Neil. ToPs were given a two-year term to develop a process to assist the archdiocese in making decisions regarding changes in its parishes' status. The ToPs group's strategic plan was three-fold. First, it was to create a parish profile of each of the 166 parishes and missions in the archdiocese. The parish profile was to be composed of two separate sources of information: a) parish survey b) parish statistics. Stewardship of resources and finances. The Second part of the strategic plan of ToPs was an organizational work plan that had timelines as the committee had only two years to complete its mandate. The Third part of ToPs' strategic plan was a communication evaluation plan for all people in the archdiocese. Its focus was transformation of people. ToPs formulated its preliminary recommendations for restructuring and gave them to the archbishop in February. The process of releasing the preliminary recommendations to the priests and people and soliciting feedback for the final recommendations to be presented to the archbishop and the priests and people of the archdiocese was handed over to the implementation task group struck by ToPs. The final recommendations of the ToPs’ are much more extensive than the preliminary recommendations. This is due to the process and feedback of the preliminary recommendations, a more focused view on the future and the creativity of many priests and people in the archdiocese. This hopefully reflects that a transformation has taken place. the process included a forum of dialogue and collaboration with Archbishop Joseph Mac Neil, the priests and the people and has resulted in final recommendations of restructure of the parishes in the Archdiocese. From this restructure of the parishes we have the Catholic Communities of Our Lady of the Angels at Fort Saskatchewan as the main parish in catering to the spiritual needs of the other communities like: Lamoureux, Bruderheim, Gibbons, Redwater, Lamont, Skaro, St. Michael and Chipman.